Today was the first rain of fall! So I did none other than whip out my trusty little bubble umbrella. 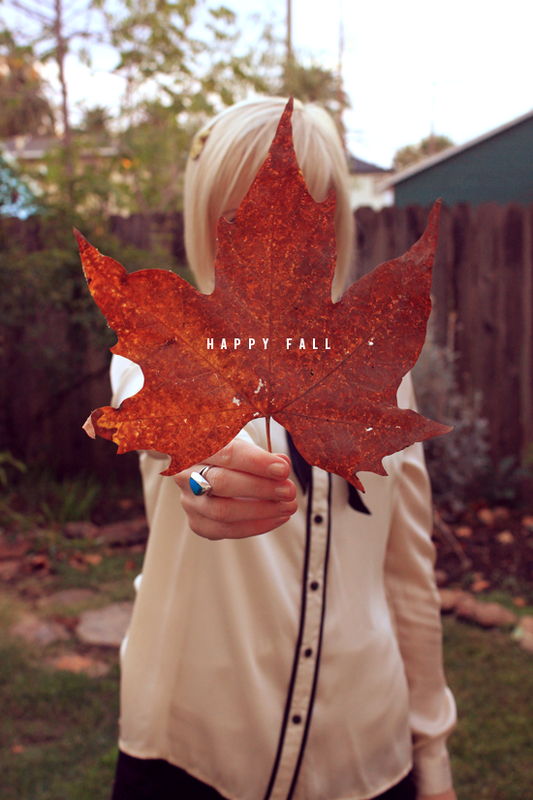 The season change from summer to fall is my favorite, because I love the variation of warm and chilly nights. It’s easy during the colder months to become one big bundled ball of coziness. I’ve been known to be walking around with long johns (under my jeans of course silly! ), wool socks and the occasional self-cut fingerless gloves (for typing at work…totally hobo status). I am realizing that my bundled ways need a balance. For instance today instead of wearing of regular skinnies I chose a cropped pair to offset all the bundling on top. For the upcoming months ahead I am thinking cropped jackets, sheer tights, pumps and bright colored pea coats. I almost forgot! Do you see that fancy mint ring on my finger? It comes from a local online shop called Compliment. Upon purchasing one of these hand-crafted pieces, a portion goes to a fund, which supports deserving students by helping them attain their college dreams. When I opened the box it came with a sweet stamped compliment, making the experience come full circle with the brands name. Also, a big thanks goes to The Lipstick Giraffe for hosting such a generous giveaway! What are you most excited about wearing for the chillier weather? LOVE this. Each piece has character, and I love your hair. Great outfit! Love the way you embrace the rainy day! I love your hair! I want to do it like that…but with blonde ombred ends! I love the bow on your shirt! And your booties are soo cute! i wish I could rock a nose ring like you do! sheesh. LOVE that blouse & your rings!! very nice outfit, love the jacket and cute umbrella. Got to say I love the pairing of the jacket with that top. Unique and classy. 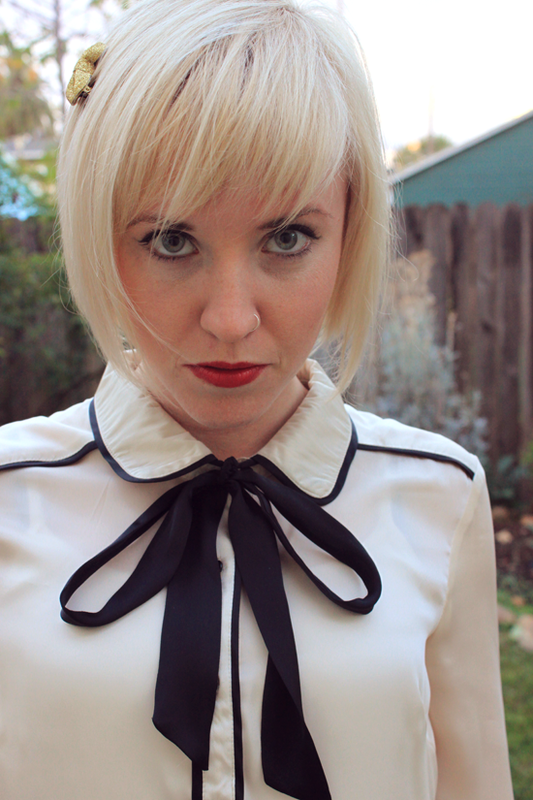 I love your blouse and the loosely-tied bow detail! Your blog layout is so cute and simple I’m not surprised that you’re a graphic designer, you have an eye for design! girl, i love that clutch! super cute. This is my first time on your blog and I can’t decide if I love your adorable face or your adorable illustrations more. About chillier weather = layers layers caramel pumpkin layers. Enough said. i love your rings the colors are sweeet. Particularily love the shoes! Great outfit choice miss. gorgeous, i love your shirt and that turq. ring! You are so adorable. Love this look and your style. 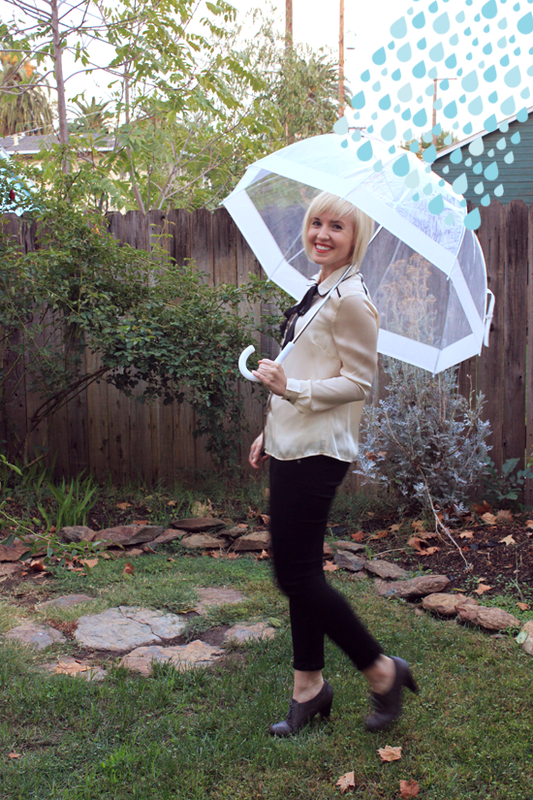 That picture with rain is too cute!n I’m following you now on Bloglovin! I’m having a giveaway on my blog if you’re interested! Oh your hair and umbrella! You are so adorable. I really want a similar top, but since I’ve sworn off retail shopping (I’m only shopping thrift store from now till February) I doubt it will happen. Perhaps a little DIY…. I adore your nose ring! Just a little touch of badass. Thanks for stopping by! It means the world to me! I’m really excited to start wearing tights and leather gloves! Thanks for the blog love! I adore your umbrella (and your bike in the “about” photo)! What a lovely blog you have! Such a nice idea with rain! I like so much style of your photos! Oh DSW and those fabulous shoes! And that first photo is absolutely adorable!! Loving the ring of course. I absolutely loveeeee your post! The script on the images is genius, I especially love the leaf one. Thank you so much for your commenting on my blog, if you want to be entered into the Giveaway please follow the requirements. Beautiful pictures and great outfit! Love your shirt. I love the ring, and what a sweet concept for a company! I’ll have to go check them out. Whoa, awesome pictures and outfit girl! 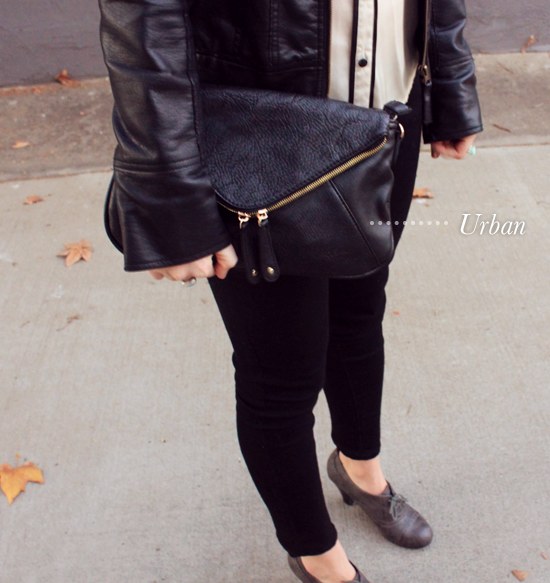 I love the heeled oxfords and your cool jacket. Absolutely gorgeous! I love your rings! Totally dig your style! I love that you live in Sacramento too! I used to live in Stockton and I thought that Sacramento was the be all and end all as far as cities went! Thanks for commenting on my blog. I am glad to have found yours, maybe we can follow each other? Beautiful outfit! I just love your blouse with the bow and that fabulous clutch! I love you outfit – and your sweet graphics! Such a fun idea – I might have to borrow some of these! Yay for first rains! Your blouse is so pretty as is your ring. Thanks so much for the sweet comment on my blog! Your jacet and blouse are amazing! Your jacket and blouse are amazing! Great outfit (especially the boots and blouse), and wicked photography! I love the little whimsical rain addition, you’ve definitely mastered the art of selective photo additions. Wish I could say the same! I love the umbrella super cute you look nice and warm! Amazing outfit! Love your rings and how you made your post!! 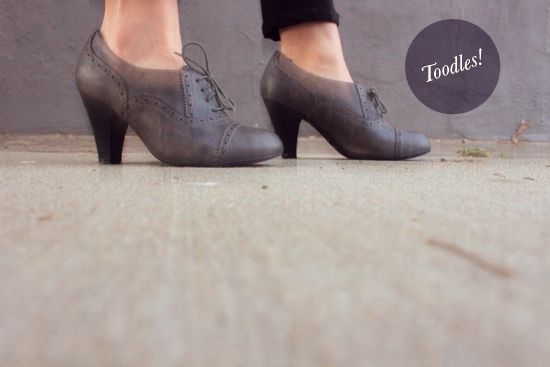 You could follow on bloglovin, RSS, or by email all of the links are on my home page. I just followed you using google friend connect. Nice! 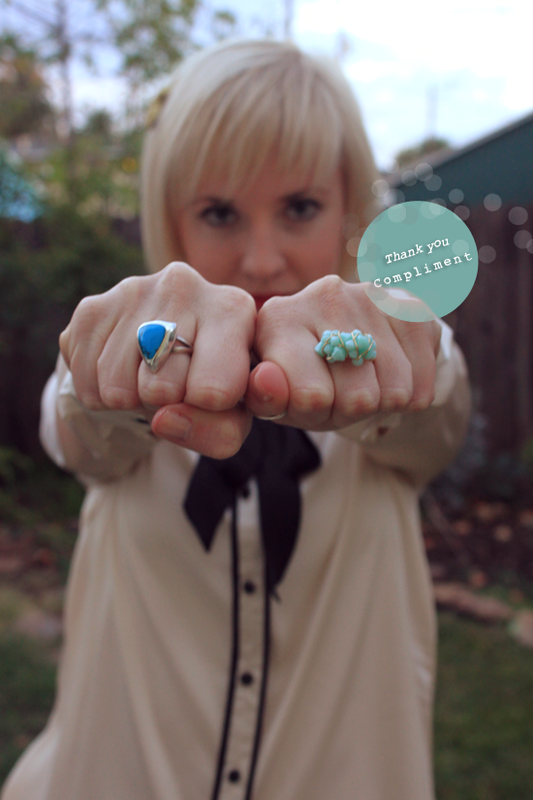 Love the mint ring!